Find out everything you need to know about dementia – from diagnosis to treatment. Dementia is the name for a collection of symptoms that include memory loss and difficulties with language, problem-solving and other cognitive abilities. Dementia isn’t a specific condition, and can be caused by a number of different factors. While it’s a progressive disease without a cure, there are certain things that can be done to slow decline. Such factors as diet, giving up smoking, exercise and social interaction can be used in combination with medication to help slow the progression of dementia – and ultimately increase the quality of life in people living with dementia. There are a number of different types of dementia. We've outlined the most common kinds of dementia below, but there are other possible causes, including a rare group of diseases called prion diseases and conditions like Parkinson's. Alzheimer's disease is the most common cause of dementia, which happens when proteins build up in the brain and form structures called plaques, which cause brain cells to die. Vascular dementia is the second most common form of dementia, and it’s caused by brain cell damage caused by a reduction in blood supply – often as a result of blood clots (also known as infarcts). Dementia with Lewy bodies, or DLB, is a type of dementia that shares characteristics of Alzheimer’s and Parkinson’s, and is caused by the build-up of proteins in the brain’s nerve cells. Frontotemporal dementia is a form of dementia that damages the frontal and temporal lobes, the parts of the brain associated with emotions, behaviour regulation, speech and the recognition of objects and faces. 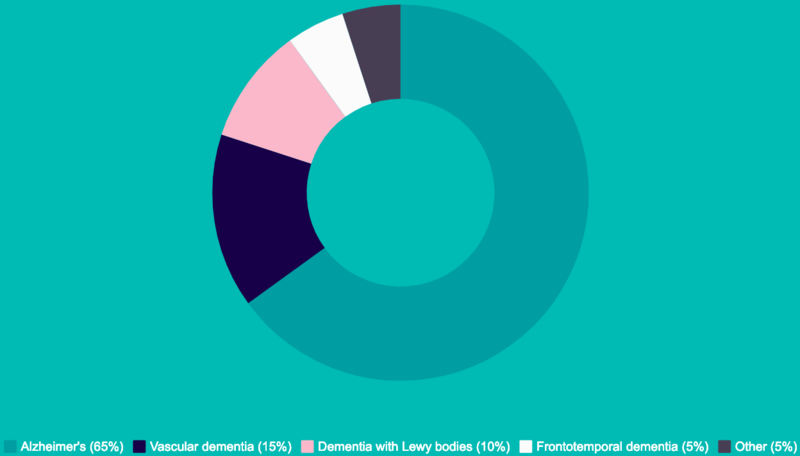 Around 10% of dementia cases are categorised as ‘mixed’ or 'mixed dementia', this means there are a combination of different dementia forms in the same patient. The most common form of mixed dementia is where both Alzheimer’s disease and vascular dementia are in effect simultaneously. Memory loss and mild cognitive impairment are common issues when people get older. If you're worried about your loved one exhibiting symptoms such as forgetfulness, you should encourage them to see their GP. They'll perform a number of checks to see if a diagnosis of dementia should be made and rule out other potential causes of symptoms such as infection or a different condition. Once a diagnosis has been made, your loved one's doctor may prescribe certain medications to slow the progression of dementia. While dementia is still incurable, these medications can increase quality of life, limit further deterioration, and in some cases even reverse some symptoms. You can find out more about the treatment of dementia here. In addition to medical treatment, your loved one may also need some support at home to ensure they're living safely. At hometouch, we offer a range of specialist dementia care – from companionship care to clinically-led care for people with complex needs. Speak to a hometouch Care Advisor to find out how we can help.